Follow the Ayurvedic path to health with this ancient approach to food as medicine. 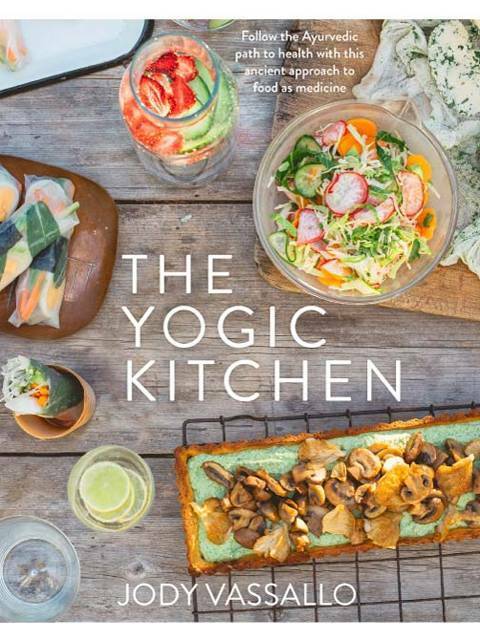 The Yogic Kitchen offers a quiet argument for a food-as-medicine approach to health, based on the ancient Indian practice of Ayurveda. Yoga is good for your body and so too is its sister philosophy, Ayurveda. Tried and tested over thousands of years, this ancient Indian food-as-medicine practice can heal and restore you, bringing balance to your system. In The Yogic Kitchen, Ayurvedic health coach, skilled cook and passionate yoga teacher Jody Vassallo, offers you a 100 recipes as well as a wholistic guide to Ayurveda that shows you how to identify which of the three main constitutions (or doshas) you are and how you can support your dosha with the right food medicine. 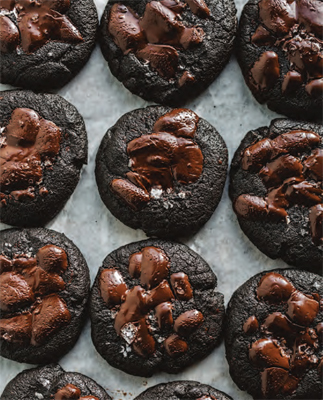 Packed full of diagnostic charts and gentle advice on the Ayurvedic way, The Yogic Kitchen translates Jody's passion for good food and good health (as well as stylish living), into recipes that do all the work for you. This book illustrates the power of the right ingredients to bring balance to the digestive system and the mind as well as joy to the tastebuds. Jody Vassallo is a food writer, stylist, yoga teacher and Ayurvedic health coach. Jody has been working as a recipe writer and food stylist for the past 25 years, collaborating with Jamie Oliver, Bill Granger and Donna Hay. She was a consultant to Jamie Oliver's Ministry of Food in Australia, and had a regular special diets column on his website. Jody's career began working with Donna Hay, writing recipes, styling and testing, and was Food Director at Murdoch Books in the late nineties. Since then she has authored seven of Marie Claire's best-selling cookbooks, and won a slew of awards for 18 additional books she authored and styled. From 2004 she authored 15 highly acclaimed regional food books for Hachette, which were published internationally, and more awards followed. She's worked for the National Heart Foundation, the NSW Institute of Sport and the Australian Institute of Sport. Jody lives in Central Tilba and works as a stylist, cook and recipe writer for a range of clients, including River Cottage Australia. Her most recent book is Beautiful Food. Yes it's good. Really, really good. Preheat oven to 180°C. Grease and line a heart-shaped cake tin or 22cm springform tin with baking paper. Place the almond meal, coconut, coconut sugar, cacao, buckwheat flour, baking powder and chia seeds into a bowl and stir to combine. Combine the peanut butter, banana and coconut water, then fold into the dry ingredients. Allow to cool for 10 minutes in the tin before turning out onto a wire rack to cool completely. To make the topping, place the banana, cacao, maple syrup and tahini into a food processor and process until smooth and creamy. Spread over the cooled cake, top with the flaked coconut and drizzle with the maple syrup. There are a few things that make a good dhal for me, and I think the most important is texture. I'm not a fan of watery dhals, I much prefer them rich and creamy – and this one truly is that. The secret is in cooking the dhal, you can't rush it. If you do, you are likely to find yourself with a pan with a nicely charred base; believe me, I've needed a lot of elbow grease to clean some of my rushed ventures. This one takes about 11/2 hours if you cook it the old-fashioned way on the stove; if you prefer, you could use a pressure cooker or a slow cooker. 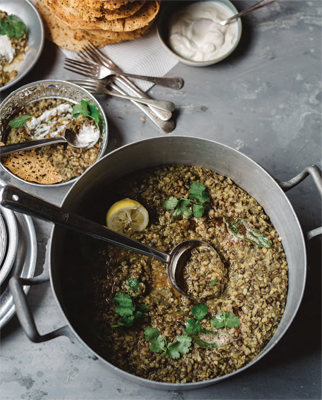 Place the urad and mung dhal in a bowl, cover with water and set aside to soak overnight. Rinse and drain well. Transfer the dhal to a large saucepan, add 2 litres of water and cook over medium heat for 11/2 hours, checking and stirring several times to see if you need to add more water. The dhal is ready when the mixture is thick and slightly creamy. You may need to increase the heat towards the end if you find there is too much liquid. Add the chilli powder, turmeric and tamarind to the pan and mix to combine. Heat the oil in a small saucepan, add the cloves and bay leaves and cook over medium heat for 1 minute, add the remaining spices and cook for 1 minute until fragrant. Add to the cooked lentil mixture and stir through. Divide the dhal between serving bowls, top with the yoghurt, finish with a good squeeze of lemon and a sprinkle of coriander and mint leaves.